According to the Philly Voice, Eagles linebacker Jordan Hicks injured his hand on his honeymoon in Greece this week. 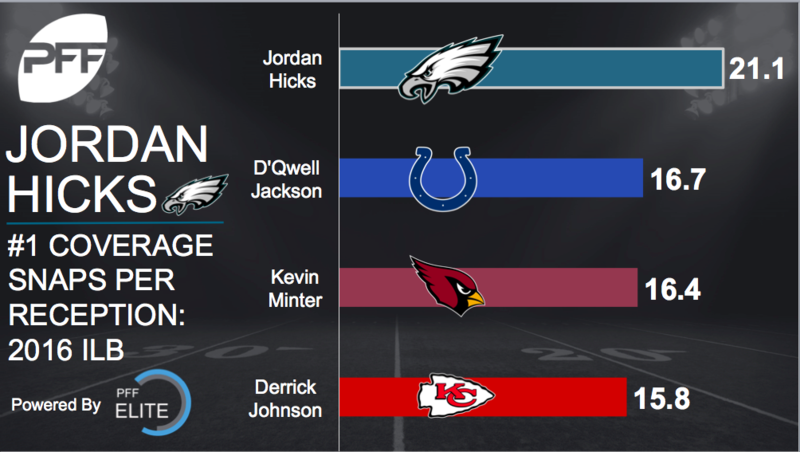 Hicks had a strong year quarterbacking Philadelphia’s defense in 2016. He was our fifth highest graded inside linebacker out of 59 qualifiers (88.0 overall) and his 91.7 coverage ranked second. The young defender led his position in interceptions (five) and coverage snaps per reception (21.1), while also averaging the lowest yards per coverage snap (0.39). The injury is said to be minor, but Hicks is one of the Eagles’ primary building blocks on defense. He could open training camp on the Non-Football Injury list if tests reveal a multi-week injury.